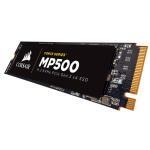 Corsair Force MP500 M.2 CSSD-F240GBMP500 240GB Expert Reviews - Read Reviews and Buy Smarter Online. Verdict: air Force MP500 is an excellent drive, both read and write speeds were excellent but most importantly its real world performance is also excellent.."
Verdict: The Corsair Force Series MP500 240GB M.2 NVMe SSD is so unbelievably fast that the only way to comprehend it's speed is to try one out. Be sure to wear your seat belt during that test and you may want to keep your hands and arms inside the vehicle at all times, it's a wild ride! Verdict: The Force MP500 is a no-doubt-fast PCI Express "gumstick" SSD, but it's a mid-pack pick among the elite NVMe crowd. The main reason to buy one versus a competitor is if it sees a price drop. Verdict: If you are looking for a Phison E7-powered SSD that has a bit more to offer than the rest, then Corsair's Force Series MP500 is just the ticket. Verdict: The SATA-based SSD market has now become quite stagnant and saturated. Prices have tumbled in recent years which has been great for mainstream users who can benefit from a slice of solid state action. Verdict: Corsair is caught in the middle of a really bad storm with no choice but to shelter in place. Financial reports from several companies indicate that the NAND shortage is just as bad as we've predicted for the last several months. Verdict: Overall, its performance is very similar to what we had expected given the results we have had with other Phison E7 controller powered SSDs. It achieves its rated specs of 3GB/s read and 2GB/s write with ease and can deliver more IOPS than you can shake a stick at in our synthetic tests. Verdict: Kitguru says: It's good to see Corsair back at the sharp end of things in the SSD market but the pricing of the MP500 needs a little tinkering with to make it truly competitive. Verdict: Samsung has dominated the solid state storage scene for the past few years and they recently updated their SSD lineup with two of the fastest drives we've ever tested. The MLC-based SSD 960 Pro and the more affordable TLC 960 Evo , both reviewed and proven to be extremely fast NVMe SSDs. Verdict: So I had hopes that the M500 would have kicked the 960 series proverbial toosh, it's fast but just not that fast. But hey it is truly great to see Corsair pursue the M2 SSD arena with a product that that offers MLC NAND and a product that makes use of that blazing fast NVMe protocol. Verdict: The speeds are ridiculous! Using this as my OS drive, and I could not be happier. Windows loads in roughly 3 seconds after the bootloader appears, which is fantastic! The read and write speeds are also great with little to no loading time on Windows applications that are stored on this drive!